The lady at the head of the queue was slicing the hot Washington air with her hand. "What I liked about Reagan," I heard her say to her friend, "was that he drew a line in the sand and said this is where I stand." The two women were waiting to file past Ronald Reagan's coffin in the Capitol. In the two days that Reagan lay in state in the US Capitol Rotunda, 200,000 people had been expected to pay their respects, most of them Reagan supporters. The millions of Americans who did not do so well under his presidency largely stayed at home. Talking to those who did turn out elicited many different memories, but underlying them all was a common theme: They all said Reagan was a strong leader. They loved the way he turned the face of America away from the gloom of Vietnam and Watergate and pushed her towards a more hopeful horizon. They loved his defiance of the Soviet Union, his willingness to stand up to labour unions. Of course, the reality was much less clear cut, but these are the distillations of his presidency which linger on today: Reagan as a man with clear convictions, the ability to communicate them and an absolute confidence that things would turn out right in the end. 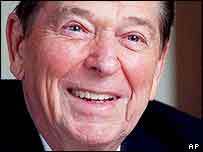 Reagan's self-assurance was so intense that it often made his opponents seem weak and vacillating. If all this sounds familiar, then that's exactly what George Bush's advisers are hoping for. The comparisons between the two men are striking and widely noted. They both faced a threat of terrorism in the Middle East. They both implemented swingeing tax cuts, precipitating a vertiginous budget deficit. They both wore religion on their sleeve and saw the world in moral terms. The Bush re-election campaign clearly believes these comparisons will help their candidate. During the week mourning the death of Ronald Reagan, the front page of the Bush/Cheney website carried a giant picture of Reagan with his top 10 speeches. There was no picture of Mr Bush. 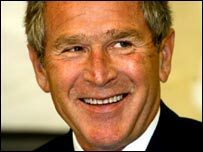 The Bush campaign had no choice but to embrace the legacy - if they had stinted in any way there would have been uproar in the Republican Party - but it is not at all clear that it will do them much good. Indeed, the Bush team faces a very real danger. 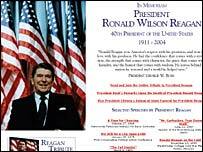 The tidal wave of Reagan memories - his smiling image, his greatest hits, the feel-good associations - may end up overwhelming George W Bush to the point where the candidate is diminished not enhanced. The president's biggest problem is that he is no Ronald Reagan, to paraphrase Lloyd Bentsen's famous put-down of Dan Quayle. Can you imagine a website with George Bush's top 10 speeches? Though denounced at the time as inflammatory, Ronald Reagan's "evil empire" remains an undeniably influential phrase, whilst George Bush's "axis of evil" already seems like a cheap rip-off with no coherent logic. There are more references to Reagan's phrase than those of Mr Bush on his own website. Ronald Reagan was astonishingly successful at reaching out to Democrats - so successful that they created a political subgroup all of their own: Reagan Democrats. George Bush, however, is loathed by Democrats. Helped by a lot of Democrats, Ronald Reagan won his elections with clear - even thumping - majorities; George Bush actually lost the popular vote. And since then, in Democrats' minds, he has reneged on his promise to be a "uniter not a divider". However illusory or insubstantial it may have been, Reagan's folksy cheerfulness did help to restore Americans' sense of self-confidence. But even the most avid Bushies would be pushed to say the same about their candidate. America today is fragile, jittery and anxious. Opinion polls after Reagan's death seemed to show that the Reagan magic has not rubbed off on Bush. A Los Angeles poll conducted the week of the funeral shows the gap between Bush and his opponent John Kerry continuing to widen, with Mr Kerry leading by seven points. Out in front of the Capitol, more than one Republican said to me with a sigh: "I wish we had a Ronald Reagan today." When the election comes around, Mr Bush might be well advised not to overdo the comparisons.